The length of the Midwest SAQA ILWI region is over 800 miles, from Northern Wisconsin to Southern Illinois. That area spans many miles of lakes, forests, farmlands, cities, towns, open sky and skyline. What inspires us? What makes us different? Similar? Our common passion for fiber art keeps us Stitched Together. 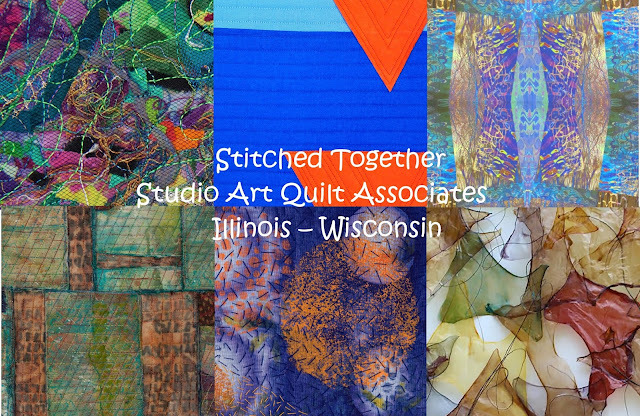 The exhibit consists of 30 art quilts by 30 artists and was juried by Illinois fiber artist Sharon L. Wright. 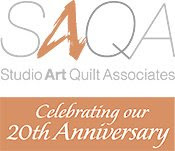 The show features contemporary art quilts with wide variations in artistic interpretation, style, and technique. Work by juror Sharon Wright and Co-curators Pat Kroth and Cynthia Wenslow will also be included.